Vanguard Bears have learned of yet more concern for Celtic Football Club. Under the Freedom of Information (Scotland) Act, we have received news that the European Commission, as part of their probe into the alleged State Aid given to the troubled football club, have found reason to investigate NHS Greater Glasgow and Clyde (NHS GCC) as well as East Dunbartonshire Council, Scottish Enterprise and the Lennoxtown Initiative. 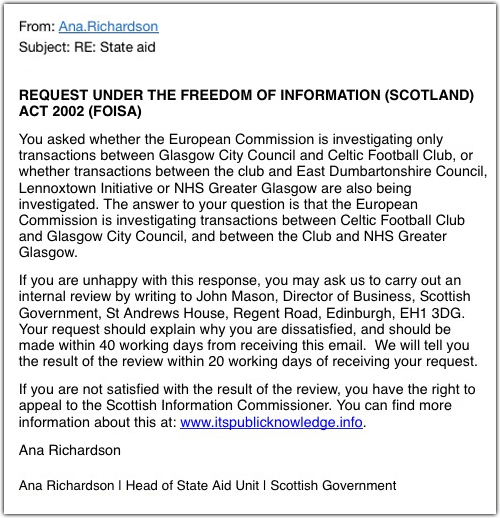 Featured below is correspondence between Ana Richardson, Head of the State Aid Unit of the Scottish Government, and one of our members where she states that the European Commisson are investigating transactions between Glasgow City Council, Celtic FC and NHS Greater Glasgow. What is also interesting about this revelation from the Head of the State Aid Unit is that it contradicts the claims made by a Scottish Government spokesperson who was widely reported earlier this year as saying that "the transaction between NHS Greater Glasgow and Celtic is not part of the EC investigation". Vanguard Bears will be seeking to find out who the Scottish Government Spokesperson was, and of course, which football team they support.